This is a pivotal week for anyone who cares about making sure that public investments — at the federal, state, and local levels — can advance the critical goals of strengthening the economy and helping families to make ends meet and advance. In Washington, the US Senate and the House of Representatives, including 14 Republican House members from California, are scheduled to hold final votes on a deeply flawed Republican tax plan that bankrolls huge tax cuts for corporations and wealthy households, explodes the federal deficit, and paves the way for major federal cuts to services that help middle- and low-income households afford the basics and access economic opportunity. The bill now before both chambers of Congress is the result of a conference committee agreement that was announced in principle last Wednesday but not released as actual legislation until Friday evening. Although the conference version of the GOP tax bill represents slight changes from both the House and Senate versions approved the prior week, the bottom line on this tax plan — supported by President Trump and Republican leadership in the House and Senate — remains unchanged: It is a bill that provides significant tax cuts to the wealthy and to major corporations, dramatically increases the federal deficit, and paves the way for deep spending reductions to core public services that improve the lives of middle- and low-income households. What’s more, as we pointed out in a recent post, scaling back the federal deduction for certain major state and local taxes (the so-called “SALT deduction”) would harm many middle-income families while making it harder for state and local governments to raise revenues to support education, health and human services, infrastructure, and other critical systems. Cut the corporate tax rate by well over a third, from its current 35 percent to just 21 percent, the largest one-time reduction in the corporate tax rate in US history. Allow so-called “pass-through businesses” — partnerships, S-corporations, and sole proprietorships — to shelter up to 20 percent of their business income from federal taxation. Cut the top personal income tax rate, which applies to just the wealthiest households, from 39.6 percent to 37 percent. This is an even deeper cut to the top income tax rate than had been called for in the Senate version of the bill. Double the amount of estate value that is exempt from the estate tax; the exemption level is now $5.49 million per person ($10.98 million for couples). In addition to reducing federal revenues, boosting the exemption to more than $10 million per person (and more than $20 million for couples) would mean fewer households subject to the estate tax, which, as we’ve noted before, already only applies to a small fraction of very wealthy households. Cap the mortgage interest deduction (MID) for future home purchases at $750,000 of mortgage debt, down from the current $1 million cap. While this would have little impact in most states, it is a blow to families who are saving to purchase a home in very high-cost areas in the US, many of which are in California. This policy change could put owning a home out of reach for many middle-income California families. Meanwhile, parts of the bill that Republican leaders claim would benefit middle- and low-income families would do little for most families. For instance, although the final tax bill would increase the federal Child Tax Credit (CTC) and expand eligibility for it, millions of working families would receive a CTC benefit of just $75 or less per year, according to the Center on Budget and Policy Priorities. 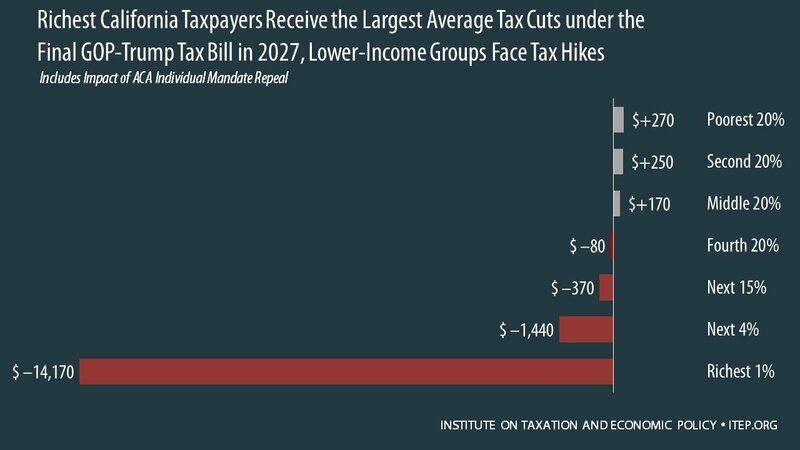 A new analysis from the Institute on Taxation and Economic Policy shows just how heavily this final Republican tax bill favors the wealthy, noting that the bill “would provide most of its benefits to high-income households and foreign investors while raising taxes on many low- and middle-income Americans.” This analysis shows that here in California, the GOP tax plan by 2027 would give big tax cuts to the richest taxpayers, at the same time that those at the bottom of the income scale would face higher taxes (see chart below). Further, the Republican tax bill would weaken the Affordable Care Act (ACA), which has broadened access to health coverage in California and other states. This is because the bill would end the ACA’s “individual mandate,” which requires most people to have health insurance or pay a penalty. Ending the individual mandate would not only cause health insurance premiums to increase, as we have discussed earlier, but would mean 13 million fewer Americans with health coverage by 2027, including an estimated 1.7 million here in California. The Republican tax bill will also attack the fiscal health of California. In the lead-up to the tax bill, Republicans passed budget plans that call for $5.8 trillion in cuts over the next 10 years to key federal supports like Medicaid, Medicare, SNAP (food assistance), student aid, and affordable housing, among many other programs. What’s more, Republican leaders have already signaled that they will introduce a budget package in early 2018 that begins to implement these cuts. For California, the fiscal implications would be significant. GOP proposals to cut Medicaid and a range of safety net services call for cutting funding for the state governments that help deliver these programs, forcing state leaders to make difficult choices between cutting services for low-income households or maintaining them at the expense of the state’s fiscal health. In other words, California’s leaders will face a choice between maintaining the economic well-being of millions of California households and the fiscal health of the state. However one chooses to describe the Republican tax bill – and journalists have called it “a true monstrosity,” “a trillion-dollar blunder,” and “possibly the worst piece of major legislation in a generation” — the stakes are clear: This GOP tax plan would do little if anything for middle- and low-income families across the nation, and especially in California, while exploding the federal deficit and forcing future cuts to the kinds of publicly funded supports that help these same families advance. And, it does all this in order to bankroll major tax giveaways to wealthy households and major corporations. In the coming days, votes in the House and the Senate will determine whether this GOP vision becomes reality. California’s congressional delegation — in particular the 14 Republican members of the House of Representatives — could choose to stand up to this ill-advised tax proposal, rather than rubber-stamping a set of policy choices that is so harmful to our state and nation.